Oooohh–if you didn’t love us before today, it’s gonna happen now. 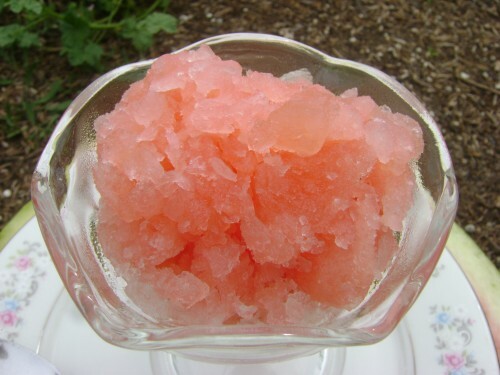 Here is our lovey first attempt at Italian Ice, and what better flavor to start with than watermelon. Positively blissful I tell you. You may even decide to throw a garden party…just because you can. Bring sugar and water to a boil. Cook and stir until sugar is completely dissolved. 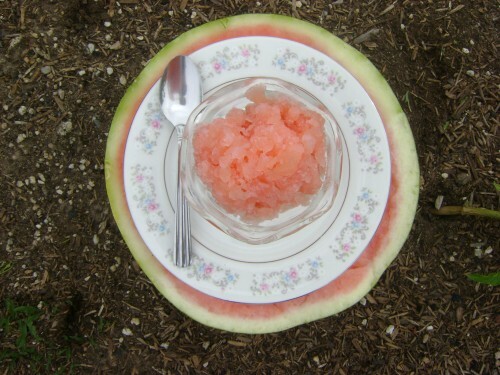 Set it aside while you work on the melon. This part is fun. Cut the middle out of a watermelon unless that will make someone really mad. In that case–just cut out enough chunks to measure about 6 cups. Now, drop about 1/3 of the pieces in the blender at a time and pulse on low. We don’t want to grind up any seeds. Pour it into a strainer and press out the juice. Discard all the pulp and seeds. 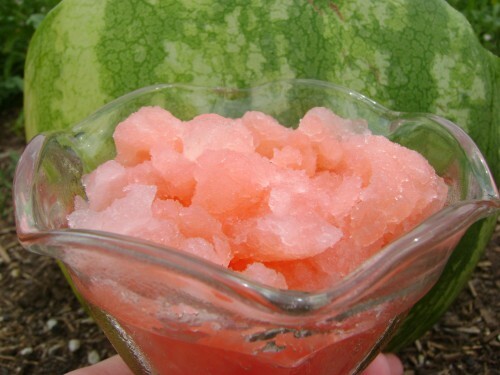 Once you’ve finished you should have about 3 cups of beautiful, sparkling watermelon juice. Now, transfer it into an 8-in. square dish and stir in the hot sugar syrup. Let it cool to about room temperature then set it in the freezer for about an hour. Take it out and stir it into pieces with a fork. Now re-freeze for about 2-3 hours longer or until completely frozen, stirring every 30 minutes or so with a fork or metal spatula. Stir again just before spooning into dessert dishes. It should make about 8 luscious servings.